Located in the heart of Downtown Long Beach, The Wine Bar is hailed by locals as the premiere wine and beer destination. This is not your average pretentious wine bar: we feature local artists, eclectic music, and a rotating wine list. Co-Owner and operator Zack Walters caught the wine fever after a transformative wine class in Bordeaux, France in 2006, and has been obsessed ever since. Through his wine adventures, he realized his goal for The Wine Bar: to bring community and great wine together in a casual, relaxed, and creatively conducive environment, highlighting the best wines he can find, paired with the best local artists. 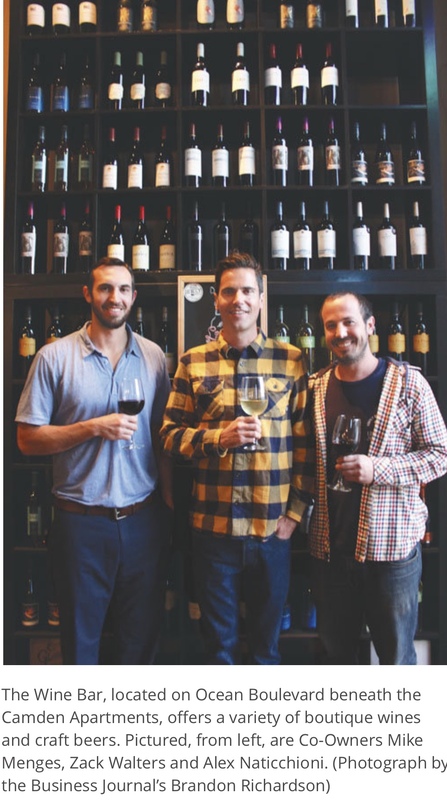 The Wine Bar started as the lovechild of Alex Naticchioni (LB Jerky) and Mike Menges in '09 before passing the torch on to Zack. Recently, Tyson Parrish, Long Beach native and long time friend and musical collaborator of Zack, has joined the fold. It's really hard to come to The Wine Bar and not end up making a friend. Whether it's jazz night with world class performers; vinyl night, where guests bring their own vinyl; or just a glass of your favorite varietal or brew after work, you're bound to have a good time and make some new friends at The Wine Bar.